I've been a journalist, a teacher and an entrepreneur. Today, I'm focused on writing fiction. I published my first novel, The Expendable Man, in 2011 and am "hard at work" on several others. At the same time I recognize that I need to keep reading good literature while I work to improve my craft. I also enjoy interacting with writers who are at a similiar points in their careers. Thanks to the web we can help each other conquer the brave new world of self-publishing. "The Expendable Man" is a political thriller. The protagonist faces two of the most-feared situations a person could find himself in -- in prison in a strange country and having to fight cancer without access to proper medical care. The Expendable Man is a tribute to all the everyday people who are thrown into life's lion den and have to find the courage they didn't know they had in order to survive. I threw in a bit of medical science fiction. Some of my doctor friends aren't too happy, but people who work for the U.S. State Department may not love my presentation of their world either. You can't please all the people all the time. Bob Dylan said that. I've been a writer since I was a teen, but only got serious after I retired from the 9 to 5 world and decided it was time to find out if I had the discipline and the talent to complete a novel that people would enjoy reading. The reviews I'm getting on Amazon suggest I succeeded. Do you stick with one genre, or have you branched out to others? Which ones? 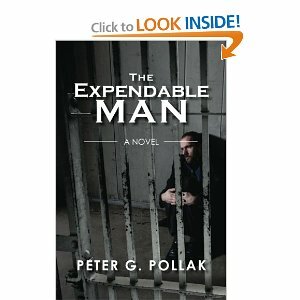 "The Expendable Man" is a suspense story. I've completed a mystery which I am about to publish under the title "Making the Grade," have another mystery that is 95% complete and I have started working on a new suspense story. Do you think you would ever branch out into another genre? If so which one(s). I have more than one fantasy novel waiting for the day when I decide which one to finish and commit to devote the amount of time that will be necessary. Like many writers, I have more ideas than I know what to do with. Ideas are not the problem. Deciding which one or two are worth the effort that it takes to complete a story that people will love reading...that's the problem. My parents. Both of my parents escaped Austria after the Nazi came to power and made a life for themselves in this country. Ann Patchett's State of Wonder and Caleb's Crossing by Geraldine Brooks. Before that I read Bill Kennedy's latest novel and wrote a long review of it for my blog. Jack London, Ursula LeGuin, Bill Kennedy, Michael Chabon, William Gibson, Samuel Delaney, Neil Stephenson, Richard Russo, Terry Goodkind, Neil Gaiman, Thomas Mann, Tolkein, Joyce, Dickens & Cervantes. Finishing two short mysteries, both of which take place in Albany, NY, and making progress on an untitled suspense story which I believe I can complete this year as well. My greatest accomplishment is yet to come, but I am commited to improve my craft as a writer so that each work is better than the previous one. I've never experienced it, but certainly I believe it exists, especially for writers who set very high expectations of themselves. Don't be your own editor. What is the best advice you have for other writers? What is more important to you, plot or character? I start with an image of a scene involving either my protagonist (suspense) or a crime (mystery). After getting that down as best I can, I plot out my story, often writing the ending early on. That's how I work, but I'm not saying that's the best way for someone else. 1. : I am blessed in that I have a good marriage with two wonderful children & 4 wonderful grandchildren. 2. : I love being outside, but of course winters are the best time to get work done. 3. : I run a news website about NYS government & politics called the Empire Page. 4. : I teach yoga in my condo and practice yoga almost daily. 5. : I play duplicate bridge with my wife as my partner.